Let’s begin with some Amanda X fan fiction: In early 2011, the band’s three members were strangers browsing in a Philadelphia-area record store when they suddenly all reached for the same Blake Babies record (let’s say Earwig), and, as they fought over the spoils of a hard day of record shopping, one of them yelled something like, “Do you dillweeds wanna start a band, or what?” before the others promptly agreed and started planning rehearsal times. While none of this is true (I think), the band’s first full length, Amnesia (via Siltbreeze), makes it understandable how it could pass for truth. A few minutes in, it’s clear Amanda X more or less just pour it out of them, which is both impressive and a sign of room to grow. 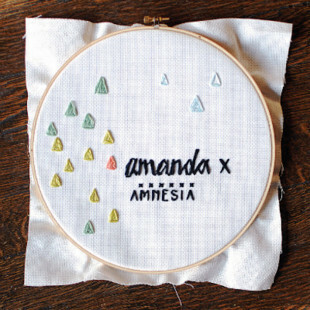 Despite having only Amnesia and 2012’s self-released Ruin the Moment EP under their collective belts, Amanda X already has a well defined aesthetic. Straightforward, somewhat chaotic fuzz pop with definite “90s feel,” they’re a band that proudly wear influences on their sleeve. While the three-piece has a sound likened to many of the great indie bands of a bygone era—Scrawl, Sleater Kinney, et al.—they sound more like the bands influenced by those bands, namely fellow Philly gals Cayetana. Drummer Tiff Yoon’s nervous, jerky rhythms and bassist Kat Bean’s constant, nimble plodding mesh well, giving Cat Park plenty of room to chug along on her dense, fuzzed-out guitar as Park and Bean trade off vocal duties. Mixing equal parts indie-pop and grunge, album-opener “Guatemala” plays par for the course with its power-chord-laden riffs and unhinged choruses full of warbling vocals and delicate “ohhhs.” And while having a distinct sound this soon out the gate is impressive, it means that Amnesia sometimes fails to mix things up enough to remain fresh. Somewhere around the halfway mark, the same simple rhythms and washed-out guitar tones start to get boring, and you wonder if Amanda X might have been better off cutting it down to a second EP instead. Certainly by the time the album reaches the standout track “Parsnip”, the band has said most of what they have to say. “Parsnip” shows off the band at its best: driving rhythms, the airy, crooning vocal delivery, and nonsensical-yet-badass lyrics like “I’ve seen into the mouth of the meteor,” all rolled up into an effortlessly cool vibe. Unfortunately, it also makes most of what comes after feel redundant. And while that’s not to say that the backend isn’t as good as the front—in fact when taken in chunks, there isn’t a single clunker on the record—it does retreads the same ground. Lyrically, the album is mostly concerned with relationships and has lines that start with “my heart”, “you”, and “I” in pretty much every song. And while the content of the lyrics is in and of itself nothing innovative, their delivery is more than enough to make them something more. When Bean moans lines like “my heart will break” in “Dream House”, she does so with such an intense anguish that any doubts of honesty are buried in audible emotion. The same can be said of the album as a whole; there’s nothing groundbreaking in 11 fuzz-pop tracks dealing with relationship drama, but it’s hard not to get sucked in by the sincerity of the songwriting. It’s that sincerity that really makes Amnesia worthwhile. There’s a definite feeling that, despite comparisons to any number of bands being 100 percent on the nose, Amanda X is something unique, and at the very least is a band that knows what its out to achieve.